We are a specialist event entertainment hire company based in Durham, providing fun and games throughout the UK for all events and occasions, including corporate events, office parties, team building days, school / college / university events, freshers week, promotional stands and so much more! All of our equipment is available to hire 7 days a week, throughout the whole year. We have so much fun entertainment for hire, including rodeo bulls, bouncy castles, interactive games, retro arcade machines, wedding entertainment and LOTS LOTS more, we’re sure you’ll find what you’re looking for.Sit back and relax while our trained staff delivery your chosen equipment and set up ready for your event starting, they will then come back at your chosen time and pack all of the equipment away…unless you would like them to stay and supervise. We are a family ran, friendly, professional company established since 2009. 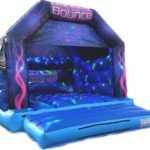 We offer top quality games, all of our inflatables are safety tested annually, our electricals hold a current pat test, we have £5 million public liability insurance and can provide copies of all paperwork along with risk assessments and method statement. 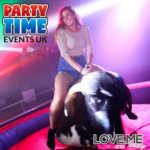 Everything we have for hire is on our website at http://www.partytimeeventsuk.co.uk with photos, prices, live availability checker and online booking form. Alternatively, you can call us on 01388 417490 to discuss your specific requirements with a member of our team. Please tell our Advertisers that you saw their entry in our "Build an Event" site. Please Note: Build an Event Ltd is not responsible for the content of external websites listed within our website.